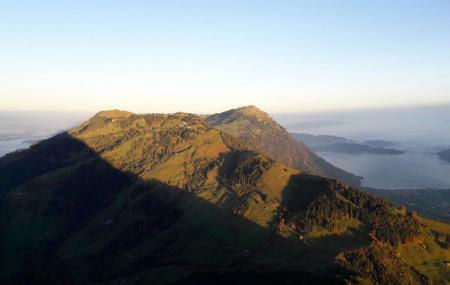 Rigi is a famous mountain which lies in the range of Schwyzer Alps. The mountain is surrounded by three lakes: Lake Lauerz, Lake Zug and Lake Lucerne. You can find a resort near the mountain where you can reserve your accommodation. You can enjoy the thrilling beauty of the mountain from the windows of the resort. It offers you to enjoy many seasonal activities here. In summer you can grab the chance to enjoy hiking whereas in winter it encourages you to enjoy sledging and skiing. You can enjoy many winter sports here too. A number of grilling stations are housed in Rigi where you can organize picnics and other get togethers. People normally also visit Rigi Pic while planning their trip to Rigi. Had an awesome experience here! Snowcap houses and mountains. Took the train up Mt. Rigi with interesting views along the way! Awesome place to visit .. I visited during July (summer) .. beautiful flowers around .. good restaurant at the top of mount rigi .. plenty of flowers to photograph .. nice trail around to trek .. use gondola or funicular to ride to top using your Swiss Travel Pass. and reach here by boat through lake .. beautiful lake views from top .. I loved my visit to Mount Rigi. While you get down to the foothills using gondola, you can see local homes with beautiful gardens around .. simply like heaven on earth .. I am adding some photos for the same.